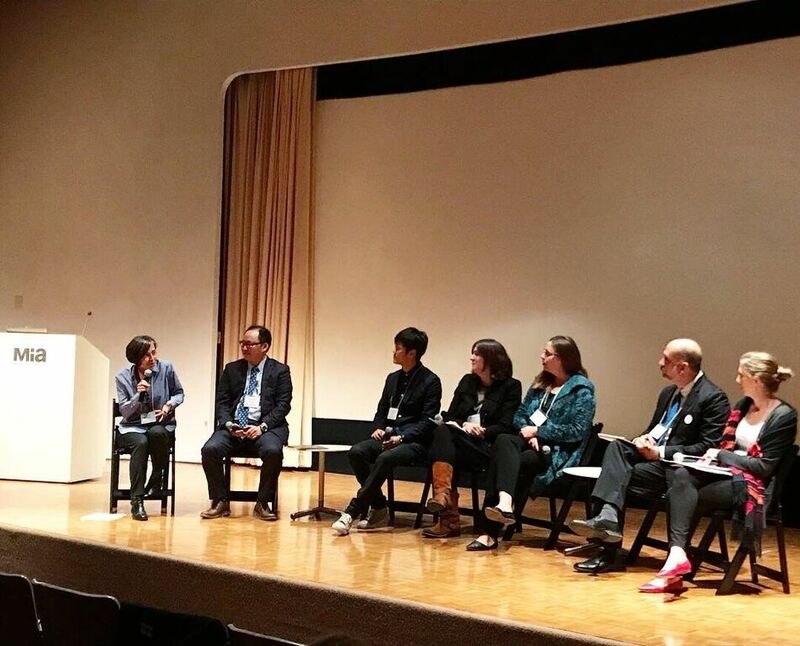 “New Practices/New Perspectives,” the Thursday evening roundtable (fig. 1), demonstrated the kinds of collaborations required to develop a history of American art that is responsive to contemporary social movements and those movements’ efforts to decolonize art institutions. In addition to Casey’s insights into pedagogy, Karen Mary Davalos shared her ongoing work on creating a database of Mexican American artists to fill a lacuna in existing research tools. 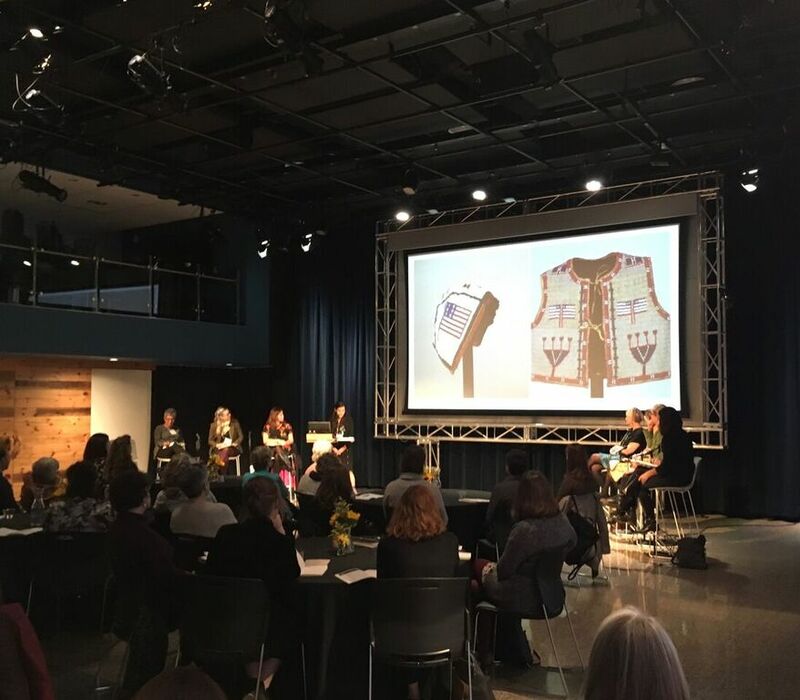 Darienne Turner discussed her upcoming exhibition of Lakota garments beaded with the American flag (a protective measure under white occupation), to open in June 2020 at the Baltimore Museum of Art. This exhibition will be displayed in the American galleries and is the first at the museum to focus on Native American art in about twenty-five years. Indeed, along with revelatory moments in the archive (in Jeff Richmond-Moll’s discussion of John Singer Sargent, Juliet Sperling’s treatment of David Claypoole Johnston, and Jennifer Sichel’s analysis of critic Gregory Battcock), the research presented throughout the conference resisted tradition through an expanded scope, which included greater attention to Native American art history (in papers by Laura Smith, Rachel Allen, Emily Burns, and Emily L. Voelker) and hemispheric perspectives (included in Anna O. Marley’s “Making History” and Florencia San Martin Riutort’s work on Alfredo Jaar). 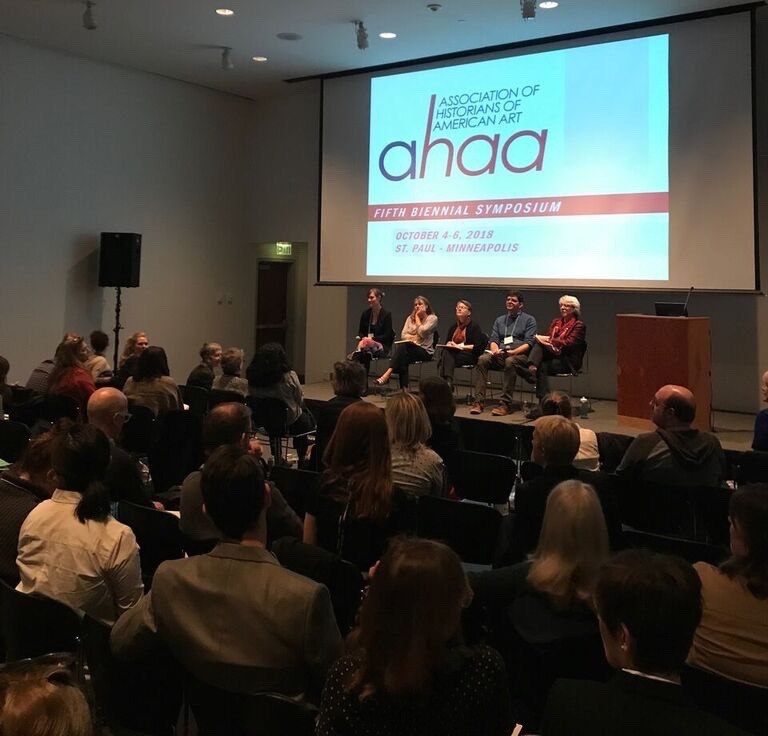 Convening at the Minneapolis Institute of Art on Friday, the first two panels worked against conventional wisdom that views the sacred and the local as necessarily anti-modern. Melanee C. Harvey offered compelling visual and primary evidence for understanding the Metropolitan AME Church in Washington, DC, as significant to the establishment of an American architecture and a center for classical black nationalism. Emma Silverman introduced an entirely different type of American religious structure, the Dickeyville Grotto in Wisconsin. Built from a hodgepodge of found objects (memorably including a petrified potato), Silverman demonstrated how the grotto, as a roadside attraction, facilitated movement and infrastructure growth in the rural Midwest. Although the lightning round (fig. 2) focused on artwork in local, Midwestern collections, travel continued as a theme. With Karli Wurzelbacher’s description, we could not help but imagine Rebecca Salsbury James’s glass paintings traveling perilously from her home in Taos to the East Coast. Peter Hanh-Chih Wang showed us how contemporary photographer Wing Young Huie has played with the form of the photographer’s road trip while emphasizing the difference of his own lens as an Asian American. In the afternoon, Phoebe Wolfskill provided a convincing precedent for Romare Bearden’s Folk Musicians (1941–42; Curtis Galleries, Minneapolis) with a little-known Ben Shahn photograph, demonstrating Bearden’s painterly skills of reinterpretation and translation. Whitney Thompson gave us her own reinterpretation for Thomas Hovenden’s Breaking Home Ties (1890; Philadelphia Museum of Art), which complicated the traditional view of the canvas as a sentimental work of nativist, even anti-immigrant bias. Taking into account that Hovenden was an Irish immigrant, she argued that the sentiments on display recall the tradition of the Irish Wake, a dramatized goodbye performed before friends and family left for the United States. 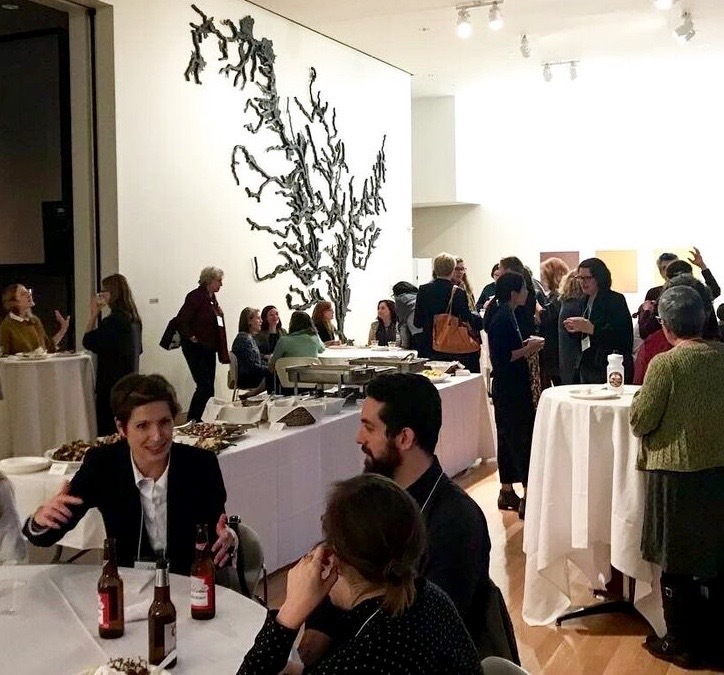 Where the previous day had been dominated by the movement of both images and artists, the last day of the conference, which took place at the Weisman Art Museum at the University of Minnesota, focused more on questions of the body. Looking closely at two portraits of Tony Luhan by Edward Curtis and Ansel Adams, Monica Bravo concluded that both artists, in spite of their different relationships with the subject, employ Luhan as a type. Similarly, Ellery Foutch contended with exploitative imagery in her discussion of midcentury artist Zoe Mozert, whose commercial self-portraits as both a pin-up girl and artist trouble the boundary between women’s agency and objectification. The “Forensic Anatomies” panel included two papers that considered representations of the body mutilated by war, both as displayed in Harper’s Weekly, analyzed by Anne Cross, and as an exhibition at the Army Medical Museum in Julia Rosenbaum’s haunting paper. A reprieve from the dark subject matter of the morning, the lunchtime workshop created well-needed space for sharing pedagogical methods using primary sources from the Archives of American Art. In the latter half of the day, Margaret Innes and Louise Siddons considered how labor activists and the Black Panther Party, respectively, used representations of the body and physical gestures in their periodicals to reach broader audiences and build coalitions. On the other hand, the final panel demonstrated how objects as diverse as eighteenth-century needlework (Andrea Pappas), presidential dinnerware (Naomi Slipp), and lead sculptures (Angelica Maier) can help us think critically about the body and its confrontation with larger systems, such as gendered divisions of labor, wildlife management, and even household plumbing. Cite this article: Vanessa Reubendale, “Wet Weather and Fertile Ground: AHAA 2018,” Panorama: Journal of the Association of Historians of American Art 4, no. 2 (Fall 2018), http://editions.lib.umn. edu/panorama/article/wet-weather-and-fertile-ground.